Product prices and availability are accurate as of 2019-04-12 01:10:09 EDT and are subject to change. Any price and availability information displayed on http://www.amazon.com/ at the time of purchase will apply to the purchase of this product. 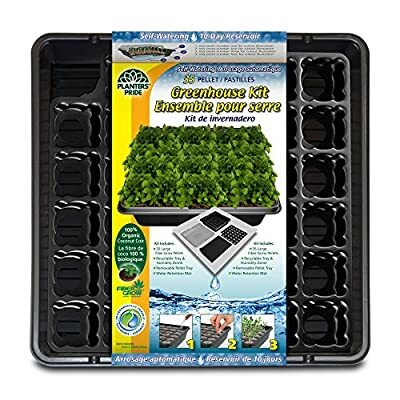 The 35 pellet self watering kit includes coconut coir pellets, a carrying tray, humidity dome and water retention mat to reduce watering and maintenance needs, to increase the success rate of seedlings and cuttings. Helpful tips and instructions set you up for success and the 100-Percent fiber grow coconut coir pellets also retain water and produce bigger plants than competing pellets.